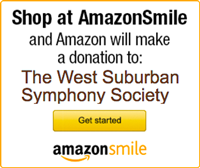 Each year since its founding, the West Suburban Symphony Society has proudly provided an opportunity each season for high-school musicians to compete to perform a solo work with orchestra. The competition is open to string, woodwind and brass instrumentalists and to vocalists. Zechariah Mo, the winner of our 2018-19 competition - our 72nd - will receive a $500 cash prize and will perform selections from William Walton's Viola Concerto with the orchestra at our May 5, 2019, concert in Hinsdale. Applications for the 2018-19 competition were due January 9, 2019, and the winner will be selected through live auditions in February. The schedule for the next season's concerto competition is expected to be similar.